Kubeflow Pipelines is a simple platform for building and deploying containerized machine learning workflows on Kubernetes. Kubeflow pipelines make it easy to implement production grade machine learning pipelines without bothering on the low-level details of managing a Kubernetes cluster. Kubeflow Pipelines is a core component of Kubeflow and is also deployed when Kubeflow is deployed. A Pipeline describes a Machine Learning workflow, where each component of the pipeline is a self-contained set of codes that are packaged as Docker images. Each pipeline can be uploaded individually and shared on the Kubeflow Pipelines User Interface (UI). A pipeline takes inputs (parameters) required to run the pipeline and the inputs and outputs of each component. A user interface (UI) for managing and tracking experiments, jobs, and runs. An engine for scheduling multi-step ML workflows. An SDK for defining and manipulating pipelines and components. 1 Click on the name [Sample] Basic - Condition. 2 Click Start an experiment. 3 Give the Experiment a Name. 4 Give the Run Name. 5 Click on the Run Name to start the Run. 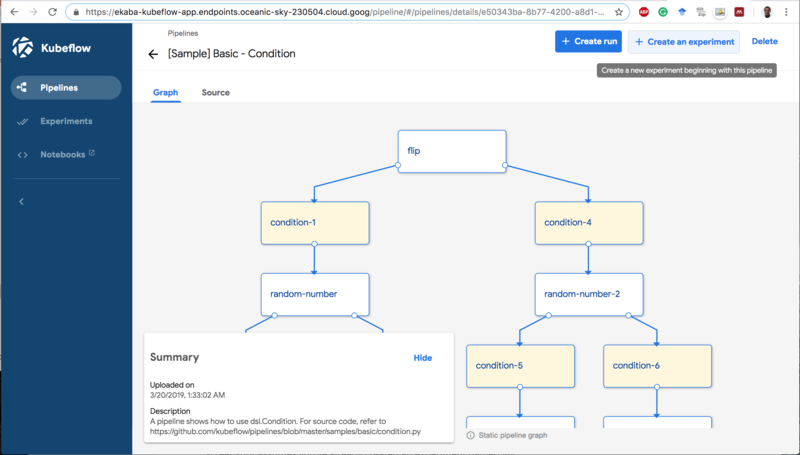 See the end of Deploying an End-to-End Machine Learning Solution on Kubeflow Pipelines to delete billable GCP resources.